Celebrate the Love month by indulging in a sweet, mesmerizing treat from Baskin-Robbins, the world's largest chain of ice cream specialty shops! 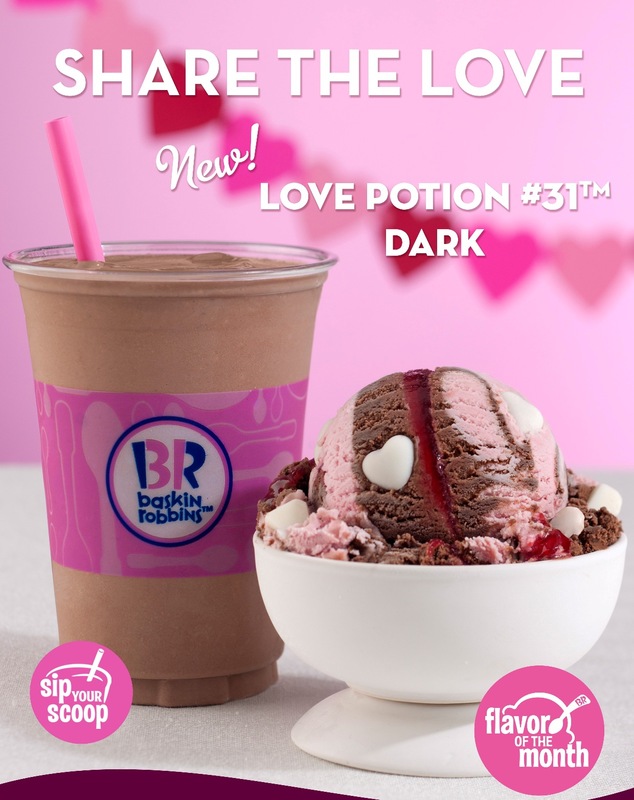 Be spellbound and fall helplessly in love with the new Love Potion #31 Dark, Baskin-Robbins' February flavor of the month. Love Potion #31 Dark is a delightful concoction of chocolate and raspberry flavored ice creams, swirled with white chocolate flavored bits, raspberry-filled hearts and a red raspberry ribbon. Love Potion #31 Dark goes well with Baskin-Robbins' classic Love Potion #31 ice cream - a well loved medley of white chocolate and raspberry ice creams with a raspberry ribbon, chocolate chips and raspberry-filled chocolate flavored hearts. The two make a perfect match of rich and creamy flavors all swirled into a single scoop and can be enjoyed together in a two-scoop ice cream sundae which is perfect on its own or shared with that special someone. Indulge in Baskin-Robbins' Love Potion #31 Dark this Valentine's and get swept off your feet in a dreamy ice cream experience. Visit Baskin-Robbins shops at Central Square and SM Aura in BGC; Greenbelt 5 and Glorietta 5 in Makati, Fairview Terraces, and Trinoma in Quezon City. Baskin-Robbins has also opened new stores in SM Southmall, Las Piñas and Solenad, Sta. Rosa, Laguna. Please visit www.baskinrobbins.ph or like their social accounts: facebook.com/baskinrobbinsph, Twitter, and Instagram @baskinrobbinsph.